June 3, 2014 | by Darcy Blake | This is a monumental day because this is your first notification that something big is about to burst, and we’ve been waiting for it a while. 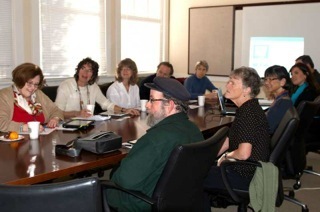 A group of us met with the National Parkinson Foundation in December—so long ago!—to discuss a major event in our area. Since then, Kayln Henkel, National Manager of Signature Events at National Parkinson Foundation has been diligently working on Moving Day, here in Silicon Valley. Kayln and the National Parkinson Foundation found a location, picked a date, and hired Colleen Fischer as Moving Day Bay Area Coordinator. My goodness, about all they didn’t do was tie it up with a pretty blue bow, but they’d probably do that too, if they could. TA DA!!! Now it is up to us to get it together, and corral our PWP force so that we can have the event of the year right here in Silicon Valley. Moving Day is Saturday, April 25, 2015. This is a major shout out to come together in support of a PD event extraordinaire in our neighborhood! More and more energy and excitement is building each day, and we will be updating the sites with lots of critical information in the coming months. If there is anything you are particularly curious about, just reach out and ask! Email Colleen Fischer, Moving Day Bay Area coordinator at cfischer@parkinson.org, or call 925-421-NPF7 (6737).